Internet Explorer 8 comes with all hog of features and enhancements. IE Addons menu has new look with different arrangement of options. Is your all new Internet Explorer slowing down? If yes then you can find possible answer by checking addons installed for IE8 on your computer. 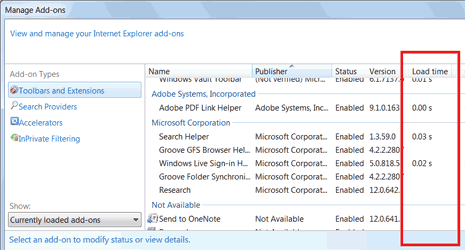 Related – How to remove or uninstall Internet Explorer8 ? You can also run IE 8 with all Add-ons completely disabled by going to the Start Menu then All Programs > Accessories > System Tools > Internet Explorer (No Add-ons) for optimal speed and performance.